Grammy®-winning singer Ayana Haviv is a versatile and very experienced professional singer, both on stage and in the studio. Classically trained, Ayana is equally proficient in any style of pop, folk, musical theater, ambient/ethereal, and "ethnic"-flavored film music. Ayana is a member and has been a soloist in Los Angeles Opera Chorus and Los Angeles Master Chorale, where she has sung everything from atonal 21st-century music to Anglican chant. Originally from Israel, she grew up singing Jewish music of all kinds, from klezmer to Middle Eastern. Ayana’s voice can be heard on the film and TV soundtracks STAR WARS: THE LAST JEDI, STAR TREK: DISCOVERY, ALTERED CARBON, DEADPOOL 2, TRANSPARENT, ROGUE ONE: A STAR WARS STORY, AGENTS OF S.H.I.E.L.D., CALL OF DUTY: BLACK OPS III, SMURFS: THE LOST VILLAGE, DESPICABLE ME 3, SAUSAGE PARTY, THE JUNGLE BOOK, GODZILLA, TEENAGE MUTANT NINJA TURTLES, DAWN OF THE PLANET OF THE APES, AVATAR, AGENT CARTER, WRECK-IT RALPH, BIG HERO 6, THE LORAX, and many more. 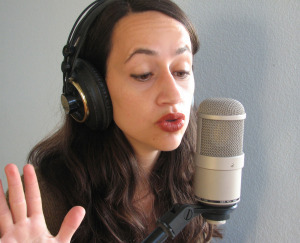 Ayana has recorded as both a soloist and ensemble singer on film and television soundtracks by Danny Elfman, Marco Beltrami, Michael Giacchino, John Powell, Aaron Zigman, Henry Jackman, James Horner, Stephen Trask, Harald Kloser, Christopher Lennertz, Sharon Farber, Penka Kouneva, Austin Wintory, Harry Gregson-Williams, Frederik Wiedmann, Heitor Pereira, and many others, as well as numerous video games and sound recordings. Ayana has been a member of choruses specializing in vocal jazz, South African folk music, a cappella, Baroque and Renaissance music, new/experimental classical music, and Bulgarian women’s folk singing. In 2007 she won a Grammy® as part of the chamber chorus Cappella, which recorded a baroque choral album, PADILLA: SUN OF JUSTICE, which won for Best Small Ensemble Performance. Ayana is an excellent sightreader and is equally proficient and rapid in learning music by ear. She can blend like butter or provide a unique and beautiful lead spot. She can match tone and style, take musical direction well, speak both “composer” and “producer”, and change styles at a moment’s notice. She is also a charismatic live performer, and brings that energy with her into the studio. Ayana can record and edit her vocals from home if necessary (with a Neumann M147 tube mic and Avalon M5 preamp) – and she does NOT need auto-tune! Classical: opera, art song, oratorio, boy soprano, straight tone, atonal, choral. Pop, light jazz, light rock, indie/alternative, gospel, soul, R&B, country, musical theater, children’s voices, characters, ethereal/ambient, animation. Slavic, African, Celtic/Irish, Middle Eastern, Israeli, American, Jewish, Klezmer, Ladino, Bulgarian, Balkan, & Yiddish folk music. 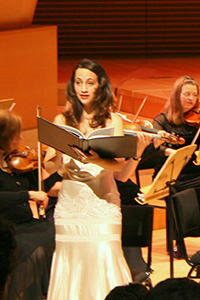 Recent live gigs include Hear Now Music Festival with new/experimental music sextet HEX Ensemble, Yuval Sharon’s production of A Trip to the Moon with the LA Philharmonic, Candide with LA Opera, and the Messiah Project with Street Symphony Chamber Singers which was featured here.